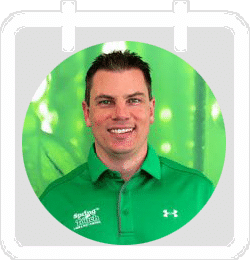 We set ourselves apart from all other lawn, pest, and irrigation franchises because you get so much more for your investment. Included with your initial investment, you will receive one year of accounting service, customer call center service, and your first year of marketing. Plus, our unequaled training and vital support is included. We have spent 45 years learning what to do and what not to do, and you will benefit from that knowledge and experience and be able to be successful right from the start. We will begin your training at our corporate facility in Minnesota, and when you are ready, we will come to your location for further on-site training. Once you begin operating your franchise, you will still receive continued support through our coaching, business planning, mentoring calls, peer groups, and annual Spring Touch reunions. Your initial franchise fee is $30,000* and includes 12 revenue opportunities compared to most other franchise models that offer you only one revenue opportunity. You would likely spend at least $100,000 at a competing franchise and still not have as many revenue opportunities available for you. More revenue opportunities means more money and growth for you! The total cost of your investment will range anywhere from $82,700 to $148,800, which includes $30,000 worth of marketing in your first year. Each franchise agreement has a term of 10 years with an option to renew for an additional 10 years. All fees, estimated initial investment costs, contracts, corporate financial statements, and other necessary information is included in the Franchise Disclosure Document (FDD). *A veteran's discount is available for qualified candidates. We have partnered with Benetrends Financial to jumpstart your entrepreneurial journey! Funding is one of the most important components in buying a franchise/business. Benetrends has been funding America's entrepreneurs for over 35 years, offering a comprehensive suite of funding options covering nearly every type of business situation. The most popular programs are the Rainmaker Plan® (IRA/Rollover) and SBA small business loan programs. And, they continue to provide innovative solutions, with their newest funding options, The Rainmaker Advantage Program®. This corporate capitalization strategy is designed to mitigate or eliminate the taxes due on the sale of a business. Benetrends also offers Securities Backed Line of Credit and Equipment Leasing. *Exclusions apply. Please consult funding experts for full details. **Once approved, a financial package will be needed for verfication. What's the best solution for you? Find out with our Pre-Qualification Funding Tool!